Facebook Lead Ads for Lead Generation and More Business! Have you tried Facebook Lead Ads for lead generation, to expand your list of prospects? Did you know that Facebook allows you to create ads with three parts? Ad itself, landing page with lead form and thank you message all in one? It’s called a Facebook lead ad. Regular Facebook ads ideally end in a click. On the other hand, successful Facebook lead generation ads give you contact information for your prospect. This data is drawn from the person’s Facebook page without their need to type. Great for those on mobile, especially. 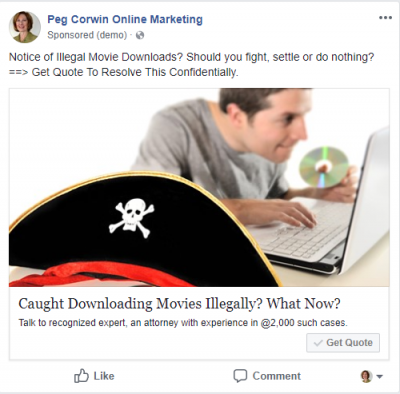 I’m going to show you an example of a lead ad about movie piracy, describe why it’s better than sending people off Facebook, and suggest where it is best used. I’m a graduate of advanced Facebook ads training from pro Jon Loomer. What I share today is from that and his ebook on Facebook Lead Ads. 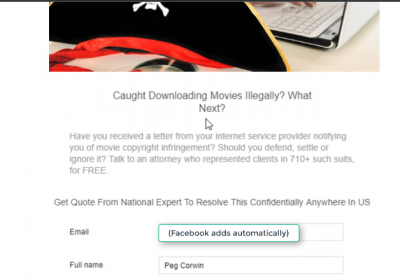 Here’s the first part of a sample lead ad about illegal movie downloading. It looks like a regular ad on Facebook. The second part of the lead ad is a landing page, which has additional copy, a call to action and a form. After the user clicks submit below the form that contains his/her information, there is a thank you page and a view website button. Get data in CSV download or link your CRM (customer relationship database) like SalesForce, Hubspot or Insightly. What are the advantages of getting leads from Facebook over sending the prospect to a landing page on your site? 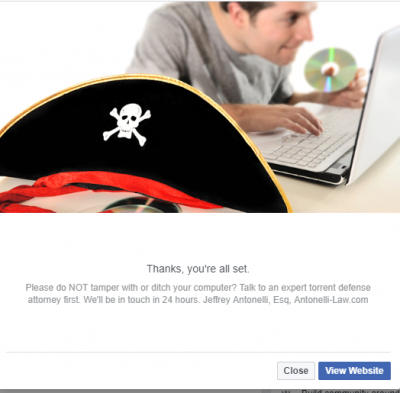 You don’t have to worry that you loose leads when your website loads slowly. There are two main instances where you can profitably use Facebook Lead Ads. Lead ads work to invite prospects to get more info on something specific, like new product specs, or free consult as this attorney does. 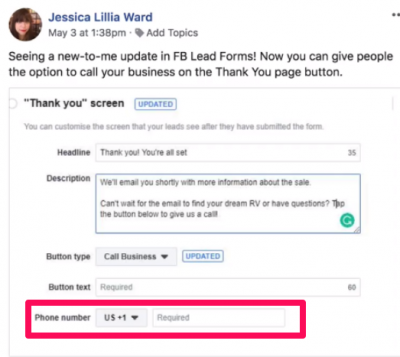 Just this week Facebook added phone call feature to the form which appears to enable an immediate call. As I’m sure you know, ads are a mechanism, not magic. 1. You must provide something of value. The offer in this example is that prospect gets free call with the attorney. 2. You must talk to the people who have that need. In the example, you might find Facebook users with this need by targeting men in certain age group who are interested in relevant topics or who are followers of pages related to relevant software. 3. You need an ad budget to experiment with different targeting to see what works best. Then the challenge is to scale that. 4. Unless you want invest time and money to learn Facebook ad management yourself, I suggest you call a pro. Find them in a LinkedIn search, through Upwork.com or in Google search. Brainstorm Lead Ads For Your Business? Might you be interested in Facebook Lead Ads? Got a question? Post a comment below.